College basketball is back today! The first official tip-off is this afternoon at 12:30pm between Wisconsin Lutheran at Green Bay. What a lot of college basketball fans will focus their attention on is this evenings double-header at Bankers Life Fieldhouse in downtown Indianapolis, Indiana where Kansas plays Michigan State and Duke plays Kentucky. As far as the beginning of the season, conversation and debates tend to gravitate toward conference predictions, who are sleepers and cinderellas to wreak havoc come tournament time, and players to watch. I will briefly touch on each of those topics in this post! The Big 12 boasts the deepest conference. They are capable of sending a majority of their teams to the tournament and make it to the second weekend. The ACC is second on my list. This may be rather bullish, but I think the ACC can send 7, possibly 8 teams to the NCAA Tournament this year. Four teams in Kenpom’s top 10 preseason ratings is telling, but does not reflect the body of work in the first couple months. It will be interesting to see how things shake out in the non-conference schedule. The Big East may have lost some talent at the top of the conference, but I think that view is a bit shortsighted. The bottom half of the conference is loaded and each conference game will be a battle. Also, Villanova has consistently proved that they effectively prepare their players to play at a high level annually. It may be a rougher start to the season for the Wildcats, but I am confident Jay Wright will have sorted things out by the time the first week of Big East play begins. The Big Ten is strong at the top of the conference with Michigan State, Purdue, Wisconsin, Michigan, and I’ll include Indiana in the mix too. But with Illinois and Rutgers associated in the same group, that drags the conference down for me. The SEC has five strong teams that I think will make the NCAA tournament, yet after those five, there isn’t much to write home about. I do think that LSU will surprise fans this year. Buffalo didn’t just beat Arizona, they absolute wiped the floor with the Wildcats. The scary thing is that five of the top six scorers are back after a 27 win season. The Bulls will be a pick to make the second weekend in the NCAA tournament this year. If St. John’s doesn’t perform well this year, then I don’t know what the future looks like for Head Coach Chris Mullins. Preseason Player of the Year, Shamorie Ponds, will continue to draw attention for the numbers he puts up in the scoring column, but the addition of Mustapha Heron and Sedee Keita bring depth to the Johnnies roster. Big East conference play will be telling how St. John’s will participate in the postseason, but I expect they will join 67 other teams in the NCAA tournament. Few seem to be talking about them currently, but the Saint Louis Billikens are on the verge of making noise this season. They are an athletic team that has phenomenal rebounding, especially in their guards. Offensive rebounding will keep the Billikens in games in addition to their physical bigs. They have a deep roster that does not give up much when the rotation goes 8, 9, or 10 deep. Loyola Chicago won the hearts of college basketball fans as they methodically made their way to the Final Four last year. Although they lost three players from last year’s team, they bring back potential All American Clayton Custer. The Ramblers will have to compete with a reloaded Illinois State team in the Missouri Valley Conference this season for the top spot. I’m on the fence if this conference has the possibility to get two teams into the tournament this season. The Nevada Wolf Pack is loaded with talent after bringing back an experienced group of players. They are a likely pick to win out their conference and make it past the second weekend in March. Western Kentucky brought in a five-star recruit in Charles Bassey. His off court issues may be the hurdle that stymies the Hilltoppers season. However, if Bassey keeps his focus on school and basketball, teammates Taveion Hollingsworth and Lamonte Bearden are set to be reliable scoring options for Bassey. South Dakota State’s Mike Daum has reached his senior season. He will produce offensively for his squad. He will need to average just under 25 points per game to reach 3000 career points – a feat achieved by only eight other players. The most recent NCAA player to score 3000 career points was Doug McDermott from 2010 to 2014. If there’s one reason that SDSU makes it back to the NCAA Tournament, it’s because of Daum and his ability to draw defenders to him and shoot accurately at a high clip. Carsen Edwards from Purdue is a do-everything type of player. His speed, ability to shoot the ball, and distribute to teammates effectively makes him a player to watch. As a sophomore Edwards averaged 18.5 points a game. Relying on him as an upperclassman invites the idea that he will be productive this season. Duke has a plethora of freshmen to watch. If you want rim-rocking dunks, Zion Williamson is more than willing to provide that entertainment. However, R.J. Barrett is the savvy lefty that is versatile on both ends of the floor. He distributes the ball at a high level and has a feel for the game that is unmatched by nearly all other NCAA college basketball players. Markus Howard’s 52 point performance that included 11 3-pointers wasn’t the ah-ha moment fans began to pay attention to Howard’s scoring ability. He’s always had it, but that performance drew more attention. Howard will provide numerous sparks for Marquette throughout the season. His role should help guide this Marquette squad to the second weekend and possibly beyond. The loudest cheers for Indiana’s first game may not be during the actual game itself. It may likely be when freshman Romeo Langford’s name is announced. His shooting will excite and his level-headed persona will surprise. Langford has potential to lead the Big Ten in scoring this season. I’m most excited to see Marquette and Indiana play each other in what should be a game that does not lack offensive scoring. It is always enjoyable to invite conversation and discussion as another college basketball season begins. As this is an opinion piece, I would love to hear which teams and players you are excited to watch this year. In the following weeks, be sure to look for updates on early season tournaments! Happy first day of college basketball! As the Butler Bulldogs prepare for the 2018-2019 season, I will be sharing information on their non-conference opponents. 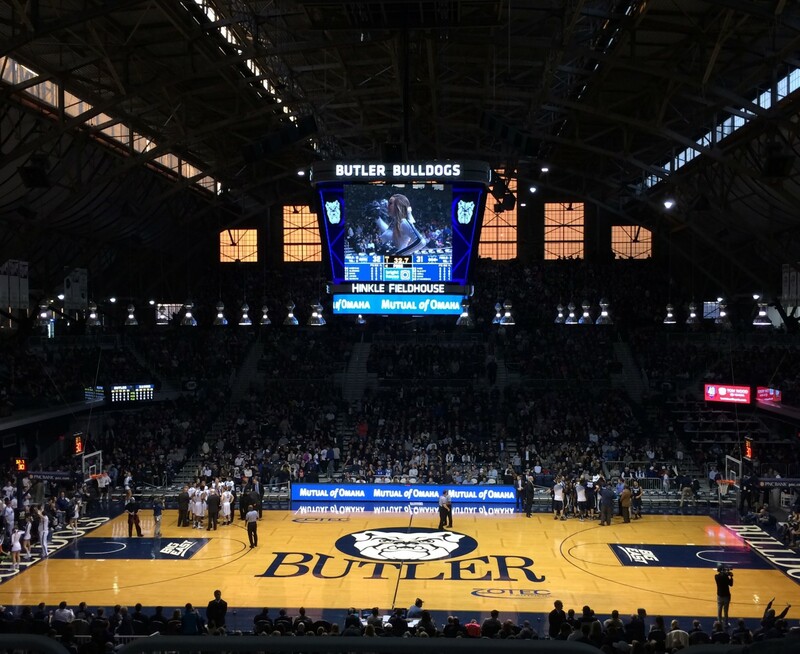 The opponents Butler will play during the non-conference portion of the season will each be given background, a brief overview of players to watch, miscellaneous information, and then conclude with an educated guess on the outcome of the game. In researching the teams, I find joy in exploring the details that I learn about different squads and how they arrived to their current state. Expect between two to four opponents to be evaluated with each post before the regular season tip off for the Bulldogs on November 10! I am excited about what lies ahead for the 2018-2019 college basketball season as a whole and for the Butler squad led by LaVall Jordan in his second year as head coach at Butler. I attended the exhibition games the past two weekends and will briefly share a few takeaways. First, as is custom to notice, veteran players look trimmer, especially rising sophomores with their appearance being drastically different. Jerald Butler and Joey Brunk shed some pounds and it shows in their speed and overall athleticism. Although it was an exhibition game against a Division II team that is coming off a 7-21 campaign last season, these games are important to see how a team meshes on the floor. Junior, Kamar Baldwin, inherits a leadership role and will likely be a primary scorer night in and night out. Sean McDermott looked great, hitting 3-4 from 3 point range (Butler was 8-25 for the game). Butler had 19 assists and 5 turnovers, both promising numbers. Something I was concerned about was stagnant play and lack of sharing the ball. Although a small sample size, it is promising to see the Bulldogs assist on 19 of their 40 made baskets. This will be a number to strive for as Butler begins their season. Seeing the turnover number in single digits will generally indicate smart play. There will be off nights, but to hope for and see these numbers is a great start for the Bulldogs. In their second exhibition game against Southern Indiana, the Bulldogs struggled to find a flow early, which is good. That may be an odd take for a fan, but to continue to grow, they need that experience going into the season. After falling behind 11-2 early in the game, Butler methodically made their way back and ultimately topped the Screaming Eagles 79-58. I will take the positive spin on this result in that the leading scorer for the game was Paul Jorgensen with 24 points. Kamar Baldwin and Sean McDermott were a collective 4-18 from the floor. Those numbers will not be sufficient especially when Big East conference play begins. With a defense that needs more time to practice, Butler will need to have difficult situations in which they can learn from. The Bulldogs defesnive shell was spread thin by ball movement and accurate 3-point shooting early against Southern Indiana. I am confident Butler will develop and grow as a team. There will be lessons to learn in the first two months of the season, but for now, the Bulldogs prepare for Miami of Ohio on November 10th. A quick note about the records against opponents: I have found information regarding Butler’s record against their opponents on sports-reference.com. The information provided goes back to the 1938-1939 season. The numbers will not be entirely accurate based on the history of results that occurred prior to that season. I appreciate the database having great depth in the records they share publicly. Thanks to Ken Pomeroy for another year with his ranking system he shares with college basketball fans. The Kenpom Rating that is shared in this post is current when the post is shared. Those numbers are malleable and will shift throughout the season. The Bulldogs tipoff the regular season against the Miami Ohio RedHawks, coached by Jack Owens. After finishing last season in MAC East conference play at 8-10, Miami looks to improve in the 2018-2019 campaign. Miami does not boast seniority on their roster. With two redshirt seniors and one junior, a younger rotation of players can be expected to take the floor. Redhawks Sophomore guard, Nike Sibande, earned MAC Freshman of the Year awards to go along with All-MAC Honorable Mention and made the All-MAC Freshman team. Sibande has connections with the Indianapolis area, calling the city home and having attended Crispus Attucks High School. Sibande averaged 15.1 points per game over the season, scoring in double figures in 28 of the 34 games played. He hit 77 three-point baskets, the third most in Miami history. He is an expected starter in Butler’s home opener. Abdoulaye Harouna is expected to provide on-court leadership for Miami as he comes off a redshirt season. Something interesting about Harouna is that he was born in December 1992, making him quite an older college basketball player than most that take to the hardwood this season. Benjamin Litteken, was a basketball manager last season for the RedHawks. The result of this game should not be close. My take is Butler shoots a high percentage from the field and wins by at least 20 points. Butler continues to field a squad with the tallest players peaking at about 6’11” or 6’10”. It’s worked in the past, but it forces their bigs to be quick and finish at the rim with a higher iq play frequently. On defense, the bigs again need to be smart with positioning, but also quick to shift laterally, blocking an easy lane to the basket for the opponent. At the end of last season, Detroit’s former head coach, Bacari Alexadner, had capped off a two year stint with a record of 16-47. The abysmal result forced the Titans into finding a coach to turn the program around. They did so in hiring Mike Davis, the former head coach of Texas Southern and Indiana. Through the offseason, the roster changed and much is not expected from Davis’s first year as he hopes to build the Detroit program as he did at Texas Southern. Junior Cole Long played limited minutes last season, but is one of the few players that comes back to the rebuilt team. He fills the stat sheet with hustle plays rather than points. Senior guard, Josh McFolley, will be the go-to scorer for the Titans. He played in all 32 games last year and averaged 11.1 points. He scored 20+ points in 4 games and 30+ points in 2 games last season. His career high is 34 points against Wisconsin Green Bay. Detroit’s outlook this season is bleak. According to Kenpom.com, the Titans are favored to win just one game. Another handful of games are considered tossups. That is due to the massive turnover of players. It could be unfair to Detroit to say they are a weak team, but because they don’t have much playing experience together as a team with their coach, it is expected that the results of winning games won’t show themselves frequently this year. Add to the mix 5 freshman and a number of transfers, this could turn into a season of overachieving or sitting in the cellar of the Horizon League. Freshman Antoine Davis is the son of head coach Mike Davis. Derrien King, a grad student, is playing for his fourth college basketball team after spending time at Santa Monica College, Washington State, Angelo State, and now Detroit. He did not play a game while at Angelo State. Just as in game one of the season, I expect Butler to use this game as another opportunity to get more minutes for younger guys once the lead has ballooned significantly. I think the Bulldogs win by 20-30 points in this contest as they gear up for Ole Miss. Game 3 Ole Miss 2017-2018 Record: 12-20; series record – will be first meeting. Mississippi visits Hinkle Fieldhouse this November for the first time. However, their new coach, Kermit Davis Jr., is no stranger to the Bulldogs. He previously coached against Butler when he was the head coach of Middle Tennessee in the 2017 NCAA Tournament Round of 64. Davis brings a different offensive and defensive system to the Rebels. What once was a more run-and-gun offense will likely transition into advantageous cuts to the basket, a scheme that saw success for Davis at Middle Tennessee. The last three years at Middle Tennessee, Davis’s teams trended toward the bottom in three pointers attempted on offense, attempting 33.6% of all shots as three-pointers last season. The defense will likely have a different look as Davis employs a 1-3-1 zone frequently. Redshirt Junior Dominik Olejniczak will cause trouble for Butler. He stands seven feet tall and can body up down on the low block as well as provide okay passing for teammates cutting to the basket. Bruce Stevens, a junior, is tall, has shown he can shoot the ball well, but historically has been inconsistent. Once rated the sixth best junior college basketball player by JUCOrecruiting.com, Stevens may provide an issue for the Bulldogs if he can hit the three ball. Ole Miss will attempt to get back to the NCAA tournament this season after alternating in and out since the 2013 season. Updated March 9 9:26 a.m.
We are in the midst of Championship Week, the height and conclusion where all college basketball teams will, for the most part, know if they are going dancing in the NCAA tournament. The Big East begins their first round tournament games this evening at Madison Square Garden for the the thirty-sixth consecutive year. St. John’s – Georgetown: St. John’s is playing in their home away from home. This can essentially be considered a home game for the Johnnies. That gives them an advantage. However, Georgetown’s size will stretch the Red Storm into taking awkward, more difficult shots. If those shots are falling, St. John’s moves onto the Quarterfinals. Give me St. John’s in this one. Marquette – DePaul: Marquette has one of the best shooting back courts in America – if they are firing on all cylinders. DePaul has made leaps and bounds progress as a team since last year, keeping most of their Big East conference games competitive. The Golden Eagles have been so up and down, it’s difficult to choose a winner in this one. During the season, Marquette won at home by 18, DePaul won at home by 8. I think this one is close and DePaul comes out on top. St. John’s – Xavier: The Johnnies pulled out a win over an athletic and skilled Georgetown team. They’ve gone toe-to-toe against Xavier too. The Red Storm has shown they are capable of taking down high caliber teams. I don’t see them dismantling Xavier. Musketeers move on. Creighton – Providence: This game will be interesting played out on a neutral court. It was a drubbing against Providence when they visited the Bluejays. The Friars held their own when Creighton visited. The Friars are 2-3 in their last 5 games. I’m going with Creighton. Their uptempo, share the ball first mindset carries them to a date with Xavier. Marquette-Villanova: The Wildcats were pushed in both conference games against the Golden Eagles this season, winning 100-90 and 85-82. If Marquette’s three-headed attack of Andrew Rowsey, Markus Howard, and Sam Hauser are firing on all cylinders, they have a chance to end Villanova’s conference tournament run much earlier than expected. The consistent, level-headed play by the Wildcats has me picking them to move on, however. Seton Hall – Butler: For the second time since the new-look Big East formed, Butler and Seton Hall finished the regular season playing each other and then meet one another in the first round of the conference tournament. Butler was not grounded defensively in their final regular season match-up, which has been the case over the course of the season. Seton Hall will have all four seniors back, a different look than last Saturday when two were out for the game. The Bulldogs are favored to win, but it depends on which team shows up for them. The Bulldogs are 2-5 in their last 7 games. I think the Pirates move on. Xavier – Providence: This season saw these two teams split the home and home match up, both winning on their own floor. Providence will have to move the ball to get open looks. I think the Friars have what it takes today to take down Xavier. The Musketeers play an uptempo brand of basketball which makes it difficult to guard them, especially in transition. I think Providence keeps it close enough where they eek out a win. Villanova – Butler: Butler is going to need consistent shooting in this one coupled with stout defense if they’d like to move on. Last night’s inspiring win over Seton Hall shows the Bulldogs can play at a high level. They need to string together a full game to be in this one against Villanova. The Wildcats displayed great shooting and sharing the ball in their win over Marquette yesterday. To be fair, Marquette is abysmal on defense. It’s no wonder the Wildcats had so many open shots. The Golden Eagles rank 176 out of 351 division-I teams according to Kenpom. Nova ranks first in the nation in effective field goal percentage. Villanova moves on. There are just 19 days until the 2018 NCAA Men’s bracket is revealed. The lack of consistency across for teams ranked in the top third creates an uncertainty in predicting seed lines. I don’t expect drastic fluctuations, but the volatility, especially the top 5 and 10 teams, has opened doors for teams to move fluidly. The NCAA is transitioning what the committee looks at when deciding who is in the tournament and where they are seeded. Below is a photo the NCAA shared back in December. I’m going to create a similar resume sheet for teams that are living on the bubble over the next two weeks as a way to give insight and allow readers to mull over which teams are deserving to be invited to the tournament.